Kendal is an exotic beauty with a sort of arabic sexiness . She is bootylicious and has inviting , sensual lips . She has a curvaceous dress size 8 body and looks stunning naked as well as wearing hot lingeries . She has different outfits and she enjoys doing role-plays . 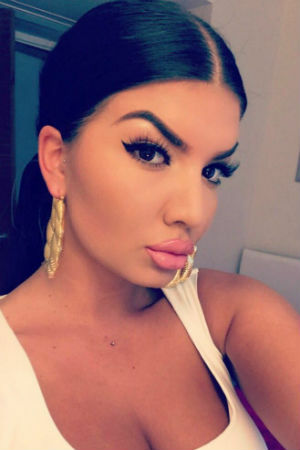 Her impeccable make-up and her olive skin make her look like one of the Kardashian sisters . The more time you will spend with Kendal , the more will discover her being outgoing and educated . We assure you that time flies when you are around our marvellous Kendal and you will want more and more of her . We are looking forward to assist you in booking her . OWO , GFE , FK , Massage , Party , Toys , Outfits .